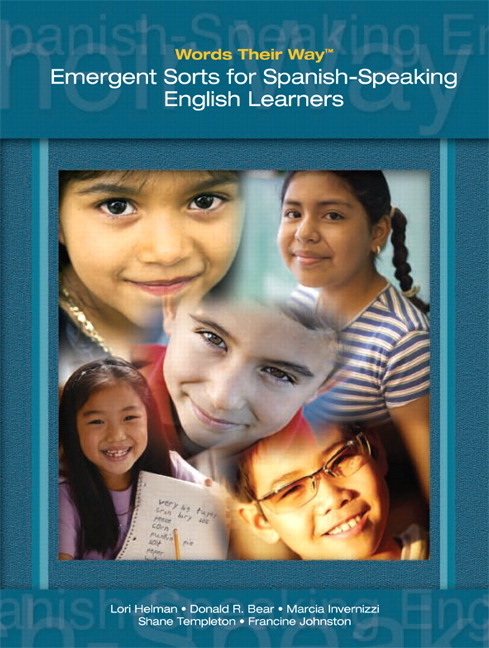 Words Their Way® Emergent Sorts for Spanish Speaking English Learners is a new text providing strategic assistance for teachers working with native Spanish speakers. Based on the same solid research and using the same scope and sequence laid out in Words Their Way® with English Learners, this companion volume begins with a series of picture concept sorts that teach students how to sort, providing guidance to help teachers make sorting meaningful. The text develops a routine for introducing the English vocabulary, helping students learn the vocabulary before they sort. The words for study are selected based on their phonetic properties as well as their usefulness in reading, speaking and understanding grade level content. The text addresses the needs of the emergent speller, whether young or not so young. The text is careful to include sorts more appropriate for older learners. Lori Helman is Associate Professor in the Department of Curriculum and Instruction at the University of Minnesota, Twin Cities. Her research focuses on the reading and spelling development of students learning English as a new language. Helman was a bilingual teacher, a district literacy coordinator, and a new teacher leader in her region before coming to higher education. She teaches classes in reading development for diverse students, effective instruction for students with reading difficulties, and leadership skills for reading specialists.